Blu Products is the manufacturer of some budget Android smartphone offerings that ship unlocked. The company has announced that it has issued a new Android update for its Vivo 4.3 smartphone bringing the device to Android 4.1. The update brings with it several new features. Blu says that it has stopped using its own custom Android launcher and will be using the default Android launcher on all of its smartphones as updates are applied. The update is available to download now and brings enhancements for battery life, the user interface, and more. The company has also announced the availability of three new colors for buyers to choose from. 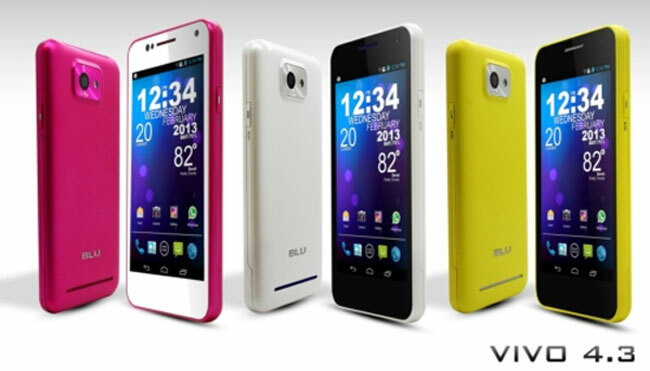 The Vivo 4.3 is now available in yellow, white, and pink colors. Other than the new colors and the updated operating system, the device has no hardware changes.